Perhaps you have been told that it isn’t in the budget to replace current drive thru signage, or any traffic control signage, for that matter. We just might have the facts that will help you change minds and recoup the expense of a signage change in as little as 4 years – from energy savings and bulb changes ALONE. Our most popular LED Open Closed signs not only look great, but can realize a significant energy savings of up to $140 per sign per year, just by replacing old energy eating signs like Neon or Incandescent. We based our following comparison charts on one of our best selling LED signs, the 7”x34” LED Direct-View dual message Open/Closed sign. In this first cost analysis, we are comparing the energy cost to operate an incandescent sign or neon sign verses the cost to operate the energy efficient LED Open/Closed sign above. ***not including tax, shipping, installation, add-ons, customizations, etc. We have also estimated the initial investment of each type of sign shown above, as well as the number of bulb replacements for the incandescent bulb option ($32.00/sign per year). You can see from the chart above that there is a significant jump between each illumination type. Going from incandescent to LED could save you $152.00/year per sign. For a four lane drive-thru that amounts to $608.00 a year! 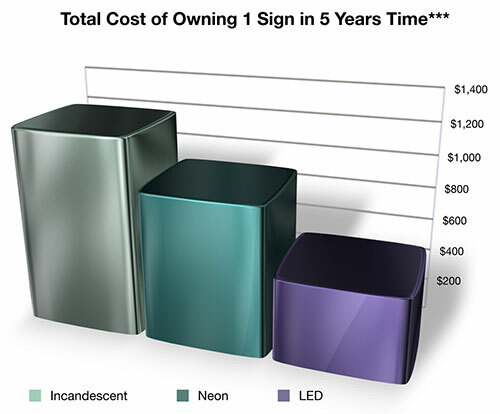 Like energy consumption costs, the overall cost of sign ownership varies greatly from an incandescent sign to a new energy efficient LED sign. Although the initial investment for purchasing an incandescent sign could be less expensive than an LED sign, the cost of replacement bulbs and the electric bill end up costing over $700.00 more over a five year span. Multiply that by 4 for a four lane drive through and you just saved yourself more than $2,800.00. We used a very conservative estimate for how often the bulbs would need to be changed out in an existing incandescent sign, and we didn’t factor in the labor costs of changing out the bulbs or the cost of a maintenance contract. With all that being said, your new sign will have paid for itself in a little under 4 years. Since the average lifespan of an LED is 100,000 hours (approx 11 years) and the warranty against defects is 5 years, your sign would be paid for before the warranty is up. Besides being energy efficient, and cost effective enough to recoup your costs in less than 4 years, our LED signs offer many other benefits. Guaranteed visible in direct sunlight. Endure continuous operation at temperatures of up to 176 degrees Fahrenheit or as low as -40 degrees Fahrenheit without diminishing the 100,000 hour expected lifespan. Quick delivery – many stock signs available that ship today. We can provide all types of LED signage that are energy efficient and maintenance free. We have many stock signs that can ship the same day they are ordered to minimize downtime. With the shortest lead time in the industry we aren't scared to customize, let us design a sign solution for you today.